I kept two stories in my head as I scrambled into dense pine forest, winding my way upwards through the foothills of the Carpathian Mountains. The first was the legend of Iorgovan, who travelled to Transylvania to obtain a mace with which to fight the dragon who dwelt in these peaks. After a long, bloody battle he managed to defeat the dragon, who scorched all the grass and trees from the mountains in his fury. The dragon told Iorgovan he would send plagues of flies to take revenge on him and his herds, before crawling away to bleed to death in the Mountains of Mehadia. His fire heated up the cave and roused swarms of angry flies, which have been tormenting the cattle on the mountain ever since. After several hours I broke through the tree-line, wandering through a rubble of rocks and shoulder-high juniper groves. Suddenly there were patches of snow, stubbornly clinging to their winter in furrows that never saw the sun. 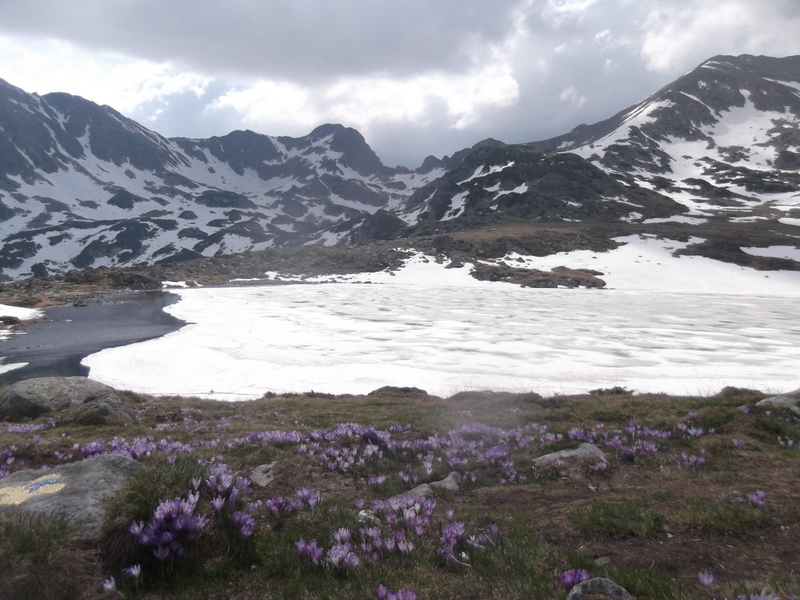 And above me rose Mount Retezat, the highest mountain in this chain, dazzlingly crowned in white. I saw from my map, with a note of shock, that the trail I was following led directly to its peak. The path began to tilt sharply upwards, and soon I found myself slipping and sliding on a slope of pure snow, walking in the eroded bootprints of a previous climber. I was unprepared for this – from down below the snow had looked like a decorative touch to the landscape, and I hadn’t really considered the reality of walking through it. The slope got steeper, the bootprints vanished, and I found myself having to chisel steps in the snow with my walking poles. By the end I was practically crawling, hands sunk deep into snow, until at last, with a final push, I could grab at juniper branches and haul myself back onto solid rock. I realised I had reached the point where there was no easy way back – the realisation felt good, for it meant I could only go on. 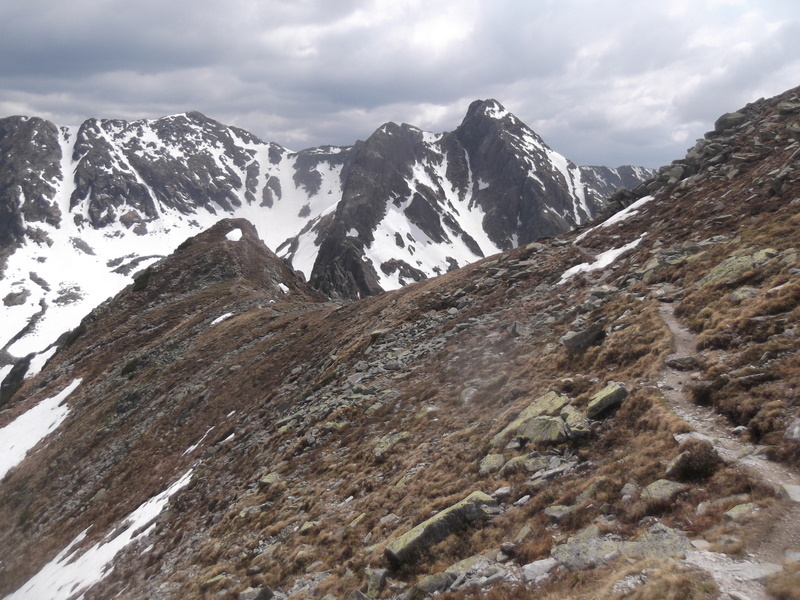 It was a hard climb now to the peak, avoiding precipitous slopes of snow that were too tough to scale, even using the poles – scrambling up slides of broken rock, hand over foot, stones clattering behind me, my legs suddenly trembling from exertion, or altitude, and probably from fear. At last, heaving for breath, I emerged at a great rounded dome of snow, with nothing beyond it but the bright, cloudless blue of the sky. There was something strangely terrifying about approaching the peak, knowing there was nothing above me now – that I could go no further up, and everything else was down. It felt like walking off the edge of the world. From the top of Mount Retezat I could see almost two days of walking behind me. 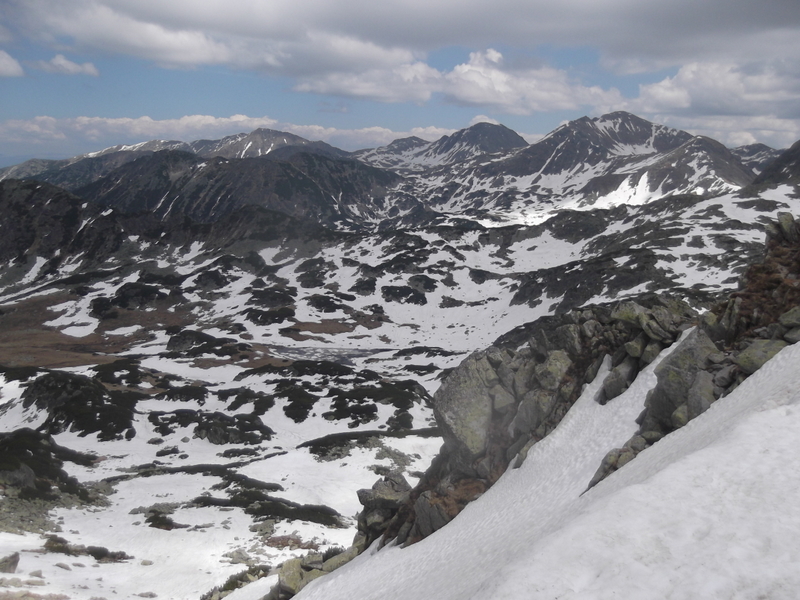 Immediately below was the grey, snow-veined rock I’d just climbed, the menacing darkness of pine woods, dropping steeply to the almost luminous green of the lower beech forests, and below that the flatlands, the scattered villages, the road I had followed to get here. Beyond that somewhere, lost in the distance, would be the line of the Mureș River I’d traced almost a month before. I knew that once I descended this peak, I’d have turned my back on that whole green world. Ahead – for the next few days, at least – there were only mountains. Psychologically, there is something different about walking through mountains, in order to get from one place to another, to recreationally walking in them – leaving your car at base camp and looping around to return to the same point in order to drive away again. Looking back at the way I’d come, knowing I would not see it again, I felt this very strongly. The mountains stood between me and where I wanted to go – I had no choice but to cross them – it felt more daunting, but somehow fundamental. As I turned from the peak the next view opened up, and it seemed too much. My eyes didn’t know what to do with it. They couldn’t comprehend the scale. A dizzying plummet to a river-tangled valley hundreds of feet below – I could distantly hear the crashing of water, snowmelt cascading into the valleys – and beyond it the rock soared up again to another, vaster chain of peaks, a visual collision of plunging angles, deep creases of snow shining brilliantly white like arcane calligraphy. A complexity of tormented rock, scooped and gouged and chiselled and scarred, utterly empty, utterly strange, hidden from the world below. After an hour of following the ridge, I descended into a new landscape of fissures and moraines, a great stepped bowl of glacial lakes and still half-frozen marshland. The nearest lake was an improbable robin’s egg blue with peculiar cracks running through its ice, the shape of a giant footprint with splayed toes. Below that lay a darker lake in a scalloped crater of snow, and below that on yet another level were two more lakes, all straight lines and angles, and still below that was a fifth, weirdly patterned and mottled, shattered like an exploded crystal. This was where, in my tent on the shore, surrounded on all sides by mountains, I would spend the night. On my way down, skirting the marshland over a stretch of dirty snow, I found myself following a line of paw-prints I took to be a dog’s. Then I realised there was no sign of human tracks alongside them – and what would a dog be doing up here, alone, miles from anywhere? The cheerful mountain rescue man had told me that wolves lived in these mountains, ‘but you probably won’t see them.’ This was as close as I got, following its solitary trail for a while before it branched away downhill, back towards the forest below – I was fairly glad to see it lead away from my sleeping place. That night, sipping whiskey as the light slowly leached from the lakeside, I found myself saying these words – again, out loud, without meaning to (you can get away with this sort of thing in the wilderness): ‘When I die, my death will not change the fact that I was here.’ And this was my best attempt at summing up the feeling of being in these mountains, my overwhelming gratitude that places like this exist. In the same way that my eyes couldn’t cope with what they saw from the peak of Mount Retezat, my conscious mind couldn’t describe the reality of being here. It seemed incredible that the same road I’d started following five months ago – from the ferry terminal at the Hook of Holland, along a cycle-path and down a canal to Rotterdam and the suburbs beyond, through petrol station forecourts and supermarket car-parks, along railway sidings and business parks and in and out of cities inhabited by millions of people – had taken me to this point. It is only one road – a road with many twists and turns, but still only one road – and it leads to this place directly, if you follow it a certain way. The following morning, having regretfully left the glacial lakes behind me, I stopped for a last look at that range and saw the peaks suddenly disappear, obscured by a swooping mass of white cloud. Within minutes, it had swooped on me as well, reducing my world to an opaque whiteness. A horrible mixture of sleet and hail splattered down without warning. I spent the next few hours inching along a bare limestone ridge, barely able to see the next paint-daubed rock that marked my trail. Sight, sound and sense of direction were swallowed up in the gloom. Occasionally the cloud would lift and the forested valleys open up below, allowing a few minutes of clumsy orientation, and then it would descend again and I’d be alone in the murk. Staggering up a narrow, snow-filled gulley, practically blind, unsure of my trail, my boots squelching with cold water, a sense of despair came over me. The journey seemed shapeless, endless. I was suddenly aware of how alone I was up here. 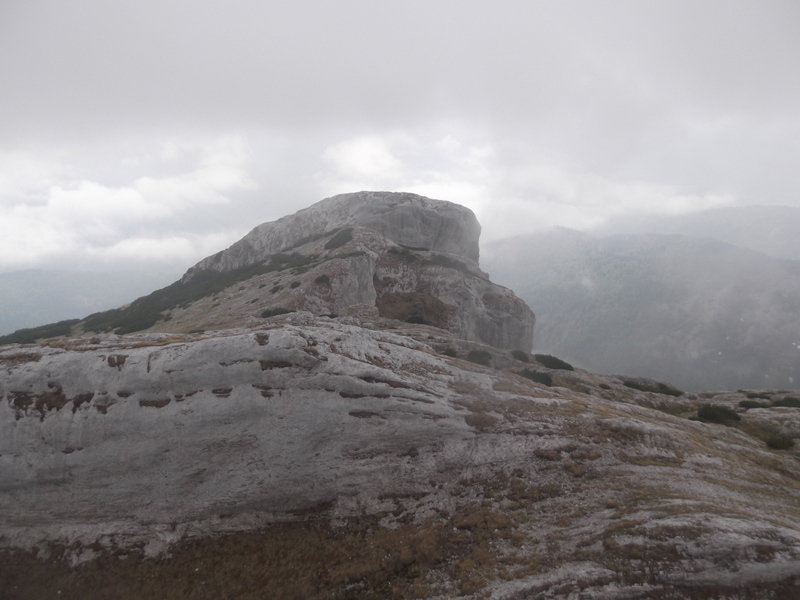 And then suddenly, out of nowhere, it appeared – Iorgovan’s Rock, my final landmark, a hump of lichen-spotted limestone looming from the haze. I dropped my rucksack and my poles and scrambled deliriously up to the peak, the last one I would climb before descending these high places. The cloud fell away and the land swam into focus, a glimpse of how far I’d come. There was the plunging void to my right, and there to my left the tree-tangled slope that would take me, zig-zagging down through scree, back towards gentler, greener land – the far side of the mountains. And there at my feet, as promised, was the hoof-print of Iorgovan’s horse, unmistakably scarred in the rock. A mighty-sized horse, for a mighty man. This article can also be seen on the Dark Mountain Project blog – a cultural movement for an age of global disruption. A beautiful description, thank you for posting. Having that difficulty in taking in the place you were in helps me understand how beautiful it must have been. Do you think The Bear felt the same when he went over the mountain? I hope he did! This part of your journey sounds amazing and a bit terrifying, really enjoyed reading about it.